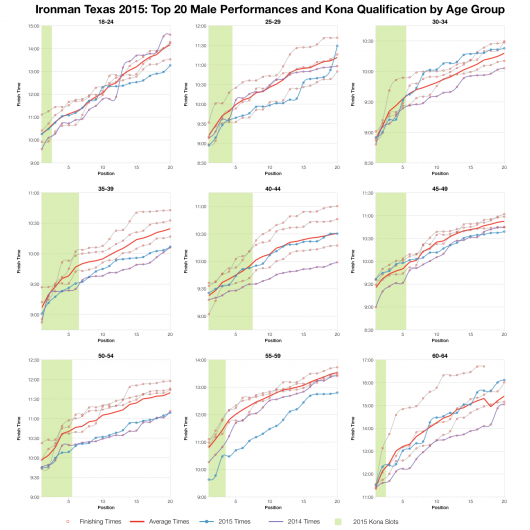 As a regional championship you’d expect Ironman Texas to attract a strong field, not least at the age group level where 75 Kona slots are on offer. This year’s race didn’t disappoint. Although the overall distribution of splits looks a little slower than in previous years the front of the age group race was as fast as ever. 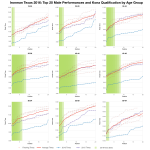 The broad, but not universal, trend comparing this year’s age group medians with previous results is of a slower race. 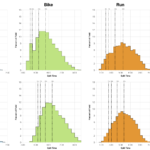 The pro ranks also show a slight slowing in swim and run, but the opposite on the bike with a fall in median splits. At the top level this years race looks slightly slower, but not by a huge margin. Looking at the finer level of split distributions backs up the median data. Each stage of the race (and hence the overall times) trends slower than the previous four years of results. 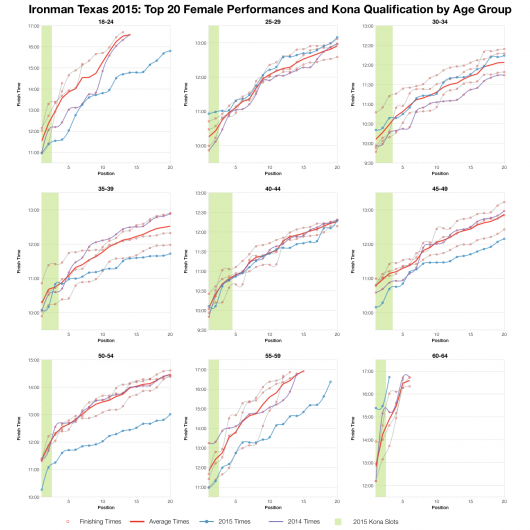 Differences are small and this shift isn’t universal across the field – the top 5-10% of 2015 bike times are a little faster than the previous results. 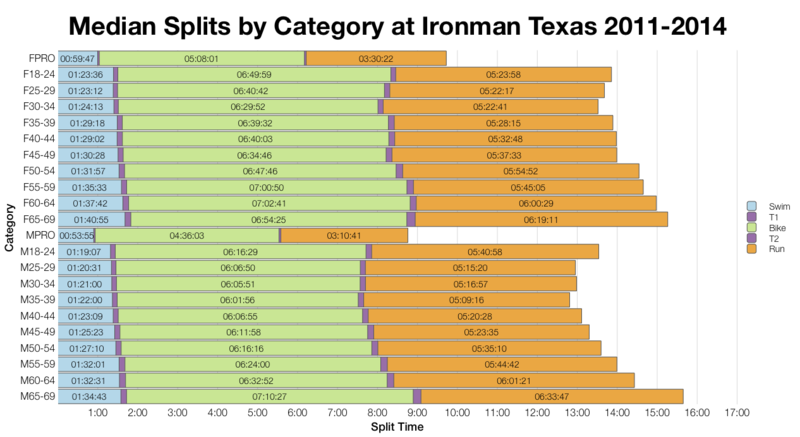 Ironman Texas may have been a little slower, but it’s hardly significant. Looking at the front of the amateur race, the top twenty in each category and age groups vary. Many of the older divisions, both male and female, were distinctly faster than average. 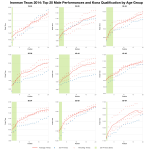 For most other age groups times in the top twenty fell much closer to average. There’s variation of course, but nothing too significant. As a whole Ironman Texas trended a little slower than in previous years, but this wasn’t evident at the front of the age group race which saw times at least on par with past results. 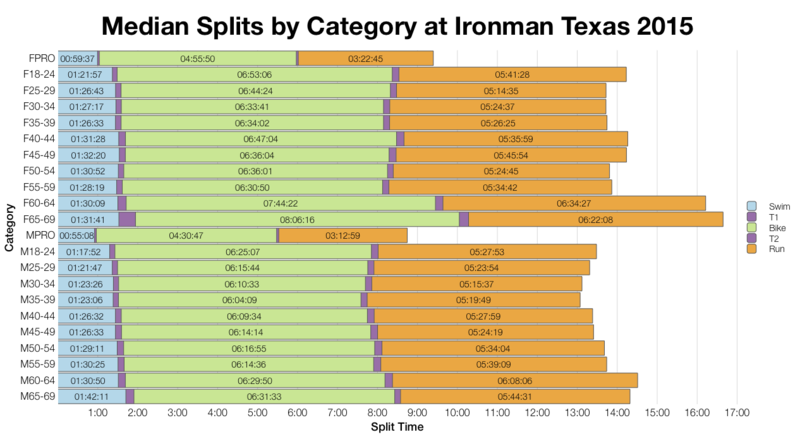 You can view the Full results and splits from Ironman Texas 2015 in spreadsheet form on my Google Drive.